Kanye, 39, was admitted to the University of California, Los Angeles clinic on Monday (21Nov16) after suffering a "psychiatric emergency". The news he had been hospitalised came after he scrapped a concert in Inglewood, California on Sunday night (20Nov16) and his representatives later announced his remaining tour dates had been axed. 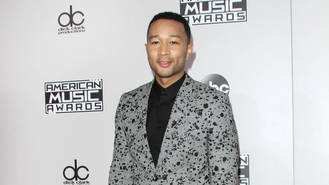 John, who has known the hip hop star since 2001, and his wife Chrissy Teigen are close friends of Kanye and his wife Kim Kardashian West, and the Ordinary People singer says he and Chrissy were with Kim in New York in the hours leading up to her husband's alleged psychiatric episode. "We were with Kim actually, you know, right before all of that," he tells America's CBS News network. "I was concerned by what I saw, so hopefully he's getting some rest and some time to figure things out." Mike Lopez, a spokesman for the Los Angeles Police Department, told news agency AFP officers had responded to an early afternoon "call of a disturbance" at an address in Los Angeles known to be the rapper's property. "That disturbance became a medical emergency where the fire department came and treated the individual," he confirmed, without naming Kanye. After her husband's hospitalisation Kim immediately flew back to the couple's base in Los Angeles, cancelling what was to be her first public appearance since being robbed at gunpoint in Paris, France last month (Oct16). A source told People magazine the hip hop superstar's breakdown occurred days after the anniversary of the death of his mother, Donda, who died on 10 November 2007. "His mother died in November, so this time of year always brings him a lot of pain," the insider said. "He keeps that pain internalized, but sometimes will talk about how hard this time of year is for him. He works through the pain every November." The source also explained that the robbery of his wife in her Paris hotel room had also hit him hard. Kim was due to attend the Angel Ball honouring her late father Robert with her family at the Cipriani Wall Street in New York on Monday (21Nov16) but skipped the bash after her husband was admitted for treatment.